The Northern States Governors’ Forum has held a meeting with the national leadership and state chapters of the Miyetti Allah Cattle Breeders Association of Nigeria, as part of efforts to find lasting solutions to the continued clashes between herders and farmers across the federation. 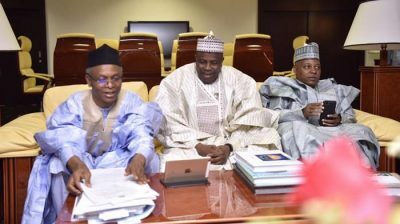 The meeting, which held in Sokoto, had in attendance NSGF chairman and Borno Governor, Kashim Shettima; host governor, Aminu Waziri Tambuwal and their counterparts from Kano (Abdullahi Ganduje), and Kaduna (Nasir el-Rufai). El-Rufai joined the meeting after it had started. In his opening remarks, Governor Shettima said the 19 northern states are worried by the rising cases of insecurity involving herder and farmers, and expressed optimism that their intervention will help in finding lasting solution to the conflicts. He said the governors were intervening in order to complement efforts of the Federal Government, and said they hope to adopt ‘local conflict resolution mechanism’ to restore trust and understanding among all the people of the region. “We have seen enough crisis in the North East with Boko Haram. We cannot afford to let any other conflict linger without a solution. “We hope to hear from all sides and finally come up with a workable plan that will restore confidence and entrench lasting peace in our region,” he added. Revealing the position of MACBAN, a source at the meeting said: “The leadership of Miyetti Allah, led by its National President, Muhammed Kirowa, told the meeting that the approach to conflict resolution adopted by political leaders in some states has not been helpful in finding lasting peace. “In his view, political leaders, especially governors, should approach issues of peace in neutral perspective, not as biased party. “He said their members have lived in many of these conflict-prone communities for centuries without conflict, but wondered why the situation is getting out of hand now,” the source added.